I've been sharing my annual running goals on the blog for the past five years. And while, in the past, it's mostly been about clocking PBs, doing races and visiting places, I feel that this year it's time to go back to the basics. Why? I'll let you in on a little secret: Hitting the 40s has impacted me more than I care to admit. And before you roll your eyes in anticipation of me saying that I've turned into a blob overnight - I haven't. But my body has definitely changed. It's ... softer. Despite fueling more healthfully than ever and running the same mileage as I have for the past decade. So while regular strength training is something that, to date, I've often neglected, I realize that it's now a necessity. And consistency in running is more important than ever. This one is more about consistency than getting closer to the Club 250 shirt. (Really!) Of course I want the shirt too, but at this stage of my life I want the benefits of regular running more. These days I spend most of my mornings researching running science for my (other, paid) job as a running writer, and if there's one thing that this has taught me, it's that the (scientifically proven) mental, physical and emotional benefits of regular running are immense. And I want that. To a committed runner this is a no-brainer, and I've been using this as my benchmark for years now. 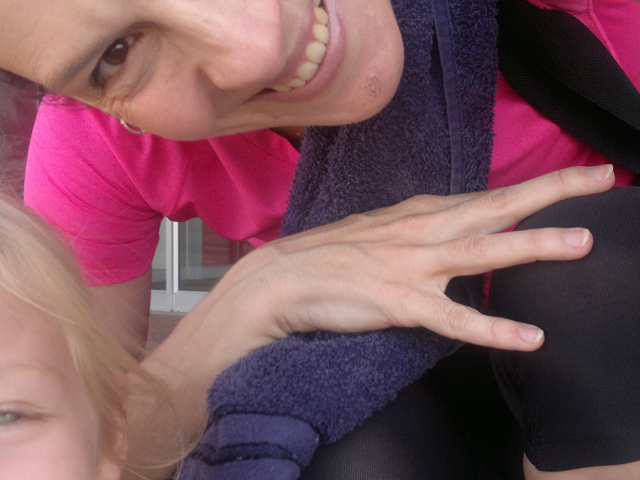 But, as a working mom with no help in the house here in New Zealand, I've found that going for a run tends to slip to the bottom of the priority list way too easily. So I'm putting it down in writing. I've been pretty diligent about chasing down my annual running goals over the past five years, so hopefully this will help me give my runs the priority that they deserve. I quickly learned after my 40th birthday that strength training has become non-negotiable. Problem is, for the first time ever, I don't have easy access to a gym or group exercise classes. Such things are rather costly here in New Zealand, and to make matters worse, one-stop gyms [with a huge pool, classes, treadmills, squash courts and (free) daycare all under one roof] are pretty scarce. Virgin Active, we misssss youuuuu! And while I'd love to join HIIT-style classes sometime in future (there's one near us, where you pay $10 or about R100 per class - a bit steep for my liking), it's not an option right now. Which means that I'll be lunging, squatting and planking my way to a stronger self at home for now. 4. Sort out that hip drop! 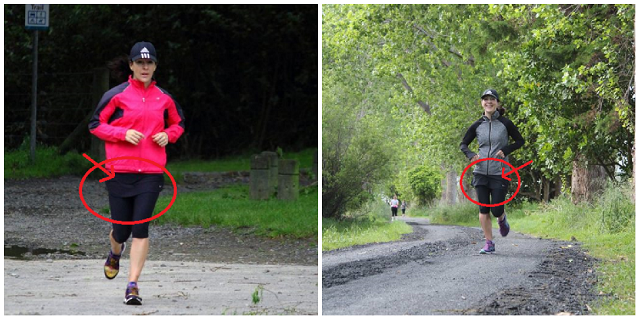 Weekly parkrun photos are a wonderful thing. And while the bulk of the parkrun community uses them for sharing parkrun adventures on social media (including moi! ), I've discovered that they're also excellent indicators of running form issues. And I'm not talking about unnecessary self-criticism, like "ooh, I look fat", or "ooh, look at my chin/hair/nose". I'm not a fan of that at all. 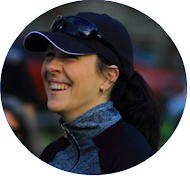 Instead, I'm talking about taking a good, honest look at your running form and working on small issues in order to improve your running efficiency. That said, over the past few months I've noticed that I've developed a rather unsightly hip drop. And, from what I've been able to gather, weak glutes and quads, as well as inflexible hips are most probably to blame. So, tying in with Goal No. 3 above, I want to spend this year sorting that out. 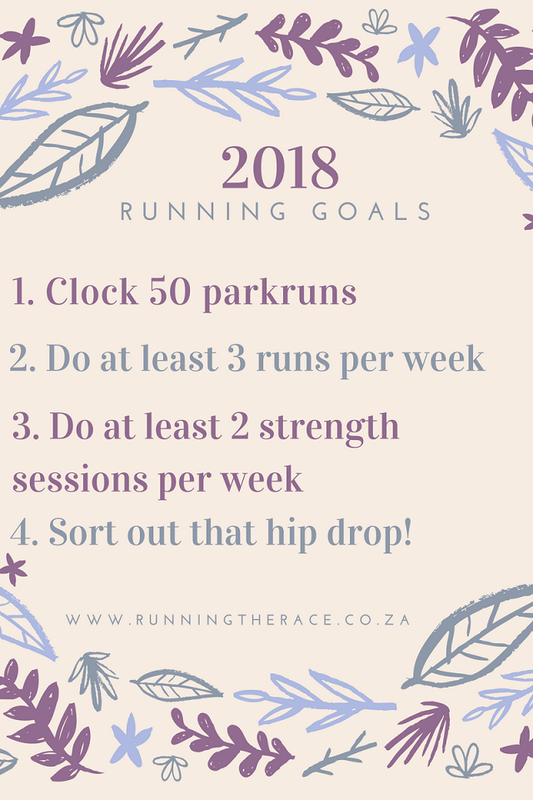 So there you have it: My back-to-basics running goals for 2018. Yes, I realize that they look like something aimed at a newbie runner. But it's what I need right now. And hopefully these goals will also contribute to increased running enjoyment and better performance throughout the year and beyond! What are your running goals for 2018? Please share - I'd love to cheer you on! Great list of goals, my goals are also taking me back to the drawing board. Thanks, Samantha! I think it's a good and necessary thing to go back to the basics (or drawing board) every once in a while to see what works and what doesn't and fix that. Wishing you a very successful and happy 2018! Great goals Karien! Oh I know about the body starting to tell you it is not 30 anymore! That is one blessing in disguise that I now have to cycle. I definitely find it more in line with my old bones. I really admire your positive attitude about making the (unplanned) switch from running to cycling - very inspiring!